What hits you when you get out of the truck at Ginda Village, in Northern Kenya, is the smell. 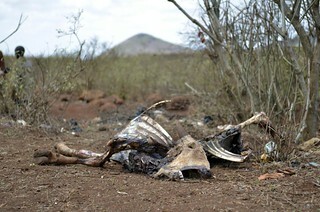 Farmer Haro Sora’s land is littered with the carcasses of cattle and donkeys that have keeled over following an intense, prolonged drought. A skull here; half a ribcage there. In some places there are whole animals slumped on the roadside. Some have died in the last few days, and the wind does little to clear the air. Ginda, in Marsabit District, has been affected by the now infamous Horn of Africa drought, which triggered a food crisis affecting around 13 million people in Kenya, Somalia, and Ethiopia. After more than a year, the rains finally returned to Ginda a fortnight ago. The fact that the food crisis in the Horn was the result of a livestock crisis has been well documented. A major pastoralist zone, when vegetation for grazing began to dry-up and livestock started to die, the knock-on effects on farmer livelihoods became strikingly clear. Now, whatever your gut reaction to the principle of a financial institution selling insurance to already cash-strapped smallholder farmers to protect them against the risk of drought, there are 650 livestock keepers in Marsabit this year who are delighted to be receiving their first payouts. The Index-based Livestock Insurance (IBLI) scheme, run by CIAT’s sister-center the Nairobi-based International Livestock Research Institute (ILRI), and a number of partners including the UK Department for International Development (DFID), is an example of a market-based, climate-smart innovation that could gain much wider currency in Africa and beyond. It’s now at the end of its second year. What triggers a payout is not how many livestock die, but whether satellite images confirm that forage availability in the region’s rangelands has dropped below a certain level. When this happens, farmers who took out insurance get paid. Using satellites to track forage cover gets around all kinds of problems, such as claims being made for animals that have died of disease or neglect, rather than drought. 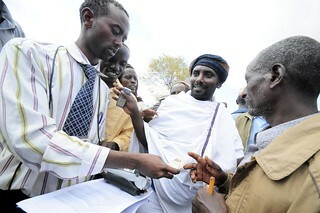 At a meeting in nearby Dirib Gombo Village, last Friday, where some of the farmers received their payouts, others were still to be convinced. Inevitably some were frustrated that they had taken out insurance in the year the scheme was launched, and despite losing animals, had received no payout because the forage threshold was never breached. They decided not to renew their policies – and then the drought hit. Back in Ginda Village, the cruel irony is that even if Haro Sora had taken out livestock insurance, he probably wouldn’t have received a payout for many of the dead animals we saw scattered around us. Already weakened by months of near-starvation, the animals were unable to endure the colder weather that followed the long-awaited return of the rains. They died from hypothermia, with green shoots springing up around them. Keep checking the blog for more examples of what does – or could – constitute climate-smart agriculture.